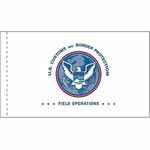 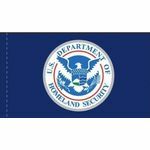 In the center of the Department of Homeland Security seal, a white American eagle appears in a circular blue field. 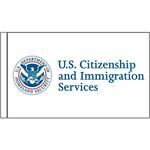 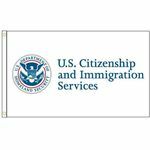 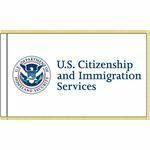 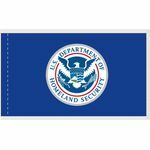 The eagle's outstretched wings break through an inner red ring into an outer white ring that contains the words U.S. Department of in the top half and Homeland Security in the bottom half. 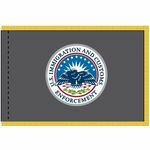 The eagle's talon on the left holds an olive branch with 13 leaves and 13 seeds while the eagle's talon on the right grasps 13 arrows. 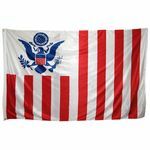 Centered on the eagle's breast is a shield divided into three sections containing elements that represent the American homeland, air, land, and sea. 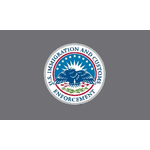 The top part, a dark blue sky, contains 22 stars representing the original 22 agency that have come together to form the department. 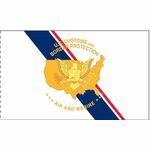 The left shield element contains white mountains behind a green plain underneath a light blue sky. 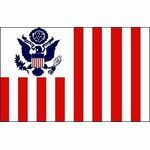 The right shield element contains four wave shapes representing the oceans alternating light and dark blue separated by white lines. 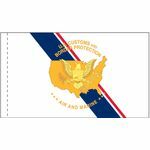 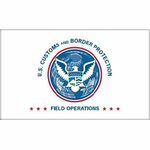 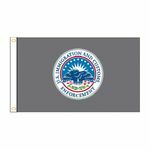 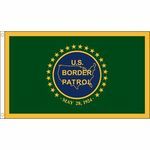 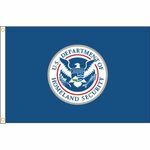 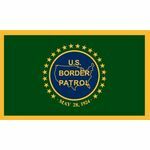 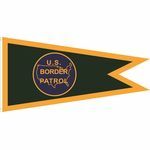 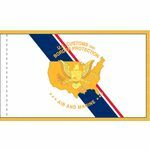 Department of Homeland Security flag (DHS), Customs and Border Protection Office of Air and Marine (OAM) flags.